Making Sense of the Unpredictability of Brian Belott and Matthew Thurber's "Volatile Vortex of Action"
Performance art is moody, finding its power in a volatile vortex of actions and references on the semiotic scale of art. Like an arbitrary signifier that does not lead to any particular end, performance as a medium is menacing in its lack of stable definition. Performance is that temperamental variable, making it difficult for some to 'get' because of its obstinacy to crystal clear meaning. With an inability to foresee a performer's trails, viewers fly head first through the labyrinthine mind of an artist in action who discounts meaning as the ultimate truth in art. Why propose conclusions when it is the constellation of empty metaphors—the indescribable ride of questions—that is important? Brooklyn-based performance artists Brian Belott and Matthew Thurber—aka Sherlock Holmes Jr. and Court Stenographer—know exactly how to keep audiences guessing in their satirically absurd performances. 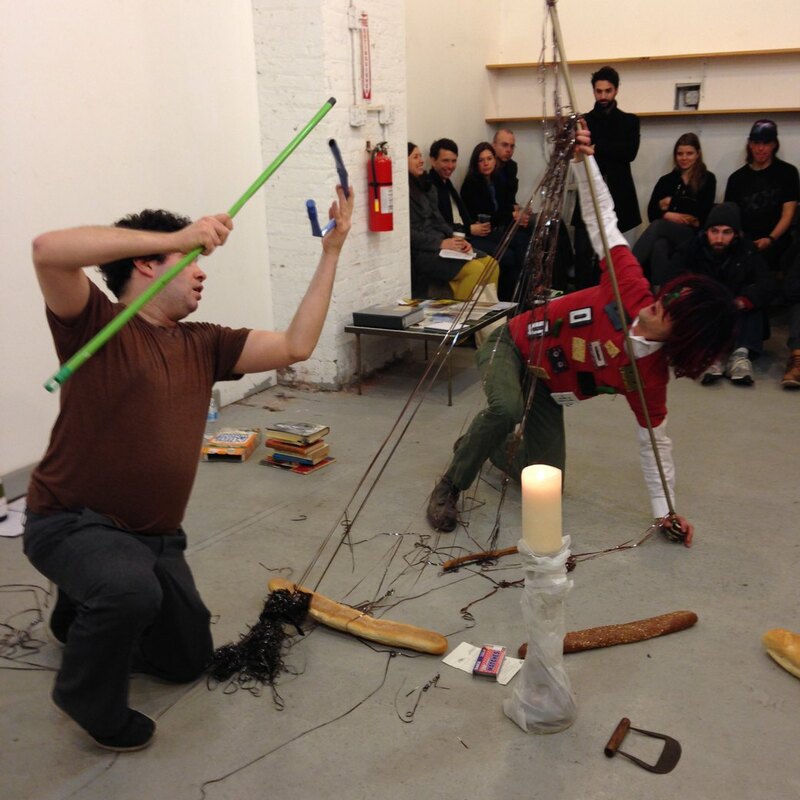 For a moment let us relive a recent performance by the duo at Storefront Ten Eyck's exhibition "Spitball," which I saw performed on Bushwick Armory Night March 8. Blinding viewers in a haze of confusion and chaos, Belott and Thurber cringed while unrolling tape cassettes, repeated a monotonous internal dialogue, threw books, caressed the floor, changed clothes, blurted out soliloquies, ravenously cut loaves of bread, and exclaimed disjunctive conversations—all within a span of about 20 minutes. What does it all mean? Perhaps the exclusively Jewish authors and the uncontrollable bread slicing is a metaphor for the Eucharist and a commentary on the ever-changing role Religion plays in contemporary life. But what about the cassette tape glasses and T-shirts? Maybe religion is too passé and the performance is instead a critique on the absurdity of our tech-driven lives. As we are shrouded by our gadgets we become more robotic—hence the oddly calculated dialogues. I'd rather believe that the meaning is not the accumulation of the parts, but the incalculable correlations between the disparate actions. Performance does not have to conclude in a total image—it is a roller coaster with no end in sight, a ride for the senses that allows you to disassociate understanding from meaning. I asked Brian and Matthew some of their influences, as inspiration can lead to an analysis of their piecemeal performances. Similarly to the disparate elements of a given performance, the range of influences is vast-yet contemporary. While the duo sites inspiration from Dada vocalists Kurt Schwitters, Raoul Hausmann and Hugo Ball, to "out there" comedians the Marx Brothers, Jonathan Winters, Andy Kaufman and Jerry Lewis, what really interests them is how easily the absurd can be tweezed out of the everyday. Writers James Joyce and Woody Allen, Avant-Garde composers Morton Feldman and Robert Ashley, along with Belott and Thurber, all these artists find a commonality in breaking the mold and pushing a medium's boundary to its limits. Belott and Thurber's style is hyper-impersonation intermixed with vocal dialects along with a "bodacious folly of vocal sound effects, pops, clicks, roars and rips." Parody is also important—by funneling a genre through humor, it emerges from the other side cloaked in a guise of superlative metaphors both serious and satirical, as words, phrases, poetic images, characters and jigs all coalesce into a void of de-symbolized actions. Our conclusion brings us back to where we started—the precarious state of contemporary performance art. The medium remains the message, whether there is meaning or not. "To approach the performance with putting some of this awkwardness first is a strategy we use a great deal," explained Belott. 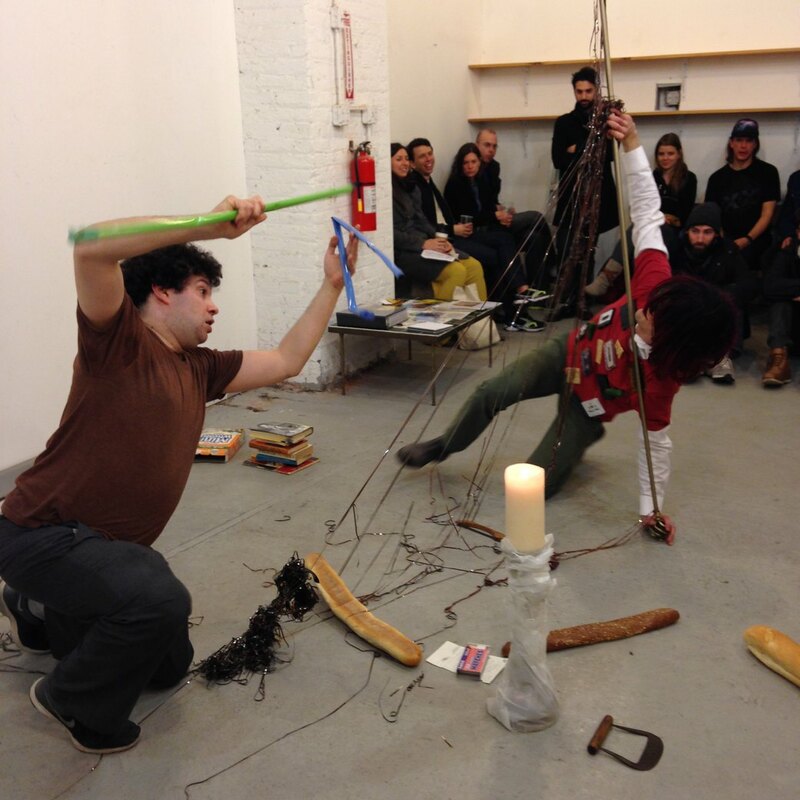 Clumsiness, nervousness, apology, priding "the uncool," exposing irrationality and infantilism, all—or non—of the above are potential tactics for these performance artists to keep the audience guessing and enjoying the thrilling ride that defines contemporary performance art's unpredictability. Check out these artist's individual endeavors this spring - Brian Belott will be included at the upcoming exhibition at Zach Feuer's new gallery Retrospective and a solo booth with the gallery Essex Flowers at this May's Nada Fair. Matthew Thurber will be performing at the Brooklyn Historical Society April 25 and his play Mining the Moon will be opening at the Brick Theater. This year, Belott and Thurber are making an album with the label Thousands of Women and will be performing at The Journal Gallery and Canada Gallery later this year.